Washington DC. January 22, 2008 (A&Y) [Pictures from March] – Tuesday began earlier than what most teens and college students would have liked, but an early rise and inclement weather looming all day did not damper the spirits of more than 20,000 young Catholics who packed into the Verizon Center (home of the NHL’s Capitals and NBA’s Wizards) to participate in the annual Rally for Life and Youth Mass in Washington DC. Those who could not find seats sat in the halls of the Verizon Center and watched the event’s happenings on the TVs near the concession stands. Hosted by the Archdiocese of Washington, the annual Rally for Life and Youth Mass drew together youth from all cultures and classes to hear the message of the Gospel of life. Through song, dance, story and testimony -- featuring musicians and lay ecclesial ministers Steve Angrisano, ValLimar Jansen and Matt Maher -- all that were present proclaimed together that their voice would not be silenced, and their generation would not be killed. After mass, the participants exited the Verizon Center and marched to the Mall with vigor issuing pro-life chants and songs that undoubtedly ascended into the heavens to tickle the toes of angels. At the Mall, the youth from the Center meet up with the other more than 100,000 marchers and caught the end of the rally on the grass at the Mall. The message being delivered at the Mall Rally by the United States politicians was unanimous: being pro-choice is the same as being un-American. To make their point, the politicians often quoted the Declaration of Independence, as they saw the pro-choice movement being incompatible to the self-evident truths and unalienable Rights of “Life, Liberty, and the pursuit of Happiness” mentioned in one of America’s founding documents. Congressman Mike Pence of Indiana gave a double-edged message as he said that “life is winning in America, but losing in DC.” Though the message might seem grim, the congressman predicted a pro-life congress in 2008 and encourage all pro-life supporters to take the three part Henry Hyde approach to the issue at hand: 1) Say your prayers. 2) Life is God’s cause not ours. 3) Take the long view (don’t seek immediate results). 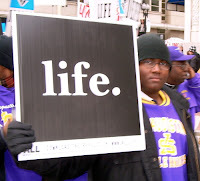 Other politicians issued similar statements and several reminded those gathered for the march that the pro-life movement is not a political, spiritual or religious movement, but it is instead a moral movement that is not limited to people of any one persuasion. Pictures from March Click Here. The photos with our monuments are particularly poignant for all the people who say they represent true freedom of expression and choice. For all the monuments pictured represent freedom under God, therefore, true freedom must be doing God's will. Duh.